This sophisticated urban loft shows like a model and it's perfect downtown location is impossible to beat! 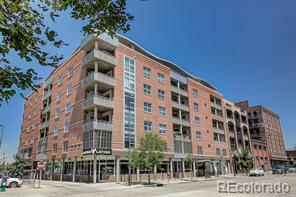 Just steps to Coors Field, LoDo, RINO, amazing restaurants, bars and shopping. The kitchen is a chef’s dream equipped with Viking stainless steel appliances, a huge island and tons of storage. Complete with beautiful hardwood floors, this home is perfect for entertaining with an open floor plan and a spacious patio that overlooks the ballpark district. The impressive master suite features a 5 piece bath with a large walk-in closet and access to the patio. Don't forget to check out the same floor storage room. At 5' x 17'-7", there is plenty of room to store skis, snowboards, bikes and everything else you need to enjoy life in Colorado! Two garage parking spaces next to each other allow for easy parking and storage. Don’t miss this opportunity…set a showing now!